With just three weeks to go before the Deepdale Christmas Market, the weekend is shaping up to be a fabulous start to the festive season. 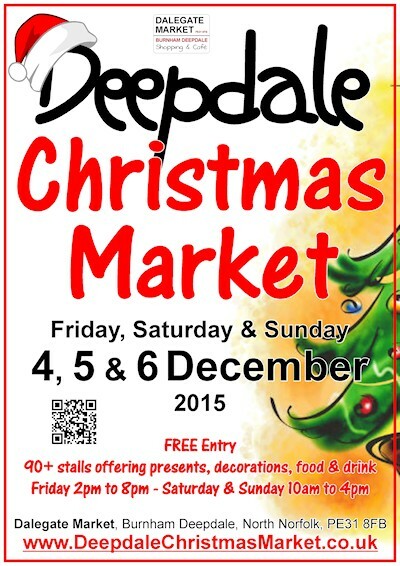 For the first time, Deepdale Christmas Market is three days – Friday 4th, Saturday 5th and Sunday 6th December. And this year there is late night Christmas shopping on Friday, with the stalls and shops open until 8pm. The perfect reason to leave the office and head to Burnham Deepdale for a festive Friday evening. Burnham Deepdale will host over one hundred stalls, shops and caterers in large marquees around Dalegate Market and amongst the pews of St Mary’s Church. A superb selection of local artisans and producers offering presents, decorations, food and drink. Many of the drink producers will have their produce on sale to enjoy while you visit the market - Norfolk Brewhouse ales, Norfolk Sloe Company liqueurs, Winbirri wines, Norfolk Cider … Not forgetting amazing hot chocolates, mulled wine, teas and coffees. Throughout the weekend there will also be great food on sale, from Deepdale Café, Proper Pizza Company, Hoggies and the Duck Truck. The event is open to the public from 2pm to 8pm on Friday, and 10am to 4pm on both Saturday and Sunday. This year the entertainment programme is bigger than ever. Norfolk solo artists, groups and choirs will be performing throughout the weekend. The highlight of Friday evening is Addison’s Uncle, a folk band who have really found a place in people’s hearts. Emma Fleming and Jessie’s Ghost kick off the music at 2pm on Friday 4th, then you’ll find music in three places during the weekend – Outside Fat Face, in the Orchard Gazebo and in St Mary’s Church. We look forward to the return of some of our favourites, including Claire Lawrence, The Quaysiders, The Fried Pirates and Vocalights Choir. The layout is adjusted each year, and it’s the turn of the Walkway Tent this year. There are many more stalls under cover in large marquees and more room to browse and wander. This year Deepdale Christmas Market is supporting four charities –Wells Community Hospital, The RSPB, Brancaster School and St Mary’s Church. “Our aim each year is to host a relaxed friendly event, with high quality stalls and great food & drink. We are really pleased with this year’s selection of stalls and are sure visitors will love the mix. Friday opening is something new for us, but the reaction seems positive so hope to see many of you that day.” Said Jason Borthwick, one of the organisers. Entrance is FREE to the Deepdale Christmas Market. There is also Free Car Parking, just follow the signs. Naturally cyclists and walkers are most welcome. If you fancy a tipple or just don’t fancy driving, then the Coasthopper Bus Service stops on the doorstep coming from King’s Lynn, Hunstanton, Wells-next-the-Sea and Cromer, please check www.travelineeastanglia.org.uk for bus times.